The United Nations Conference on Sustainable Development, popularly known as Rio +20, was one of the major international events of 2012. Over 100 Heads of States and Governments along with 45,000 participants attended this event which was supposed to nail an agreement on “the future we want” (the motto of the conference). The conference created big hopes and delivered very little, as opposed to Rio 92 United Nations Conference on Environment and Development where important and policy-changing agreements were drafted and signed. 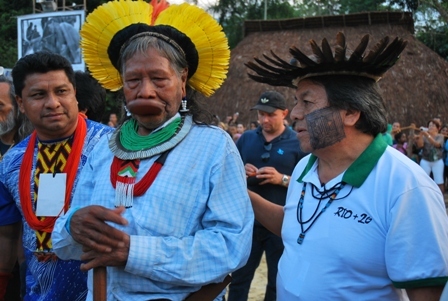 Civil society had a strong participation in Rio+20, and one special event part of the UNCSD was the World Indigenous Peoples Conference on Territories, Rights and Sustainable Development, also known as Kari-Oca II. This conference was organized by the Inter Tribal Committee of Brazil (Comitê Intertribal de Memória e Ciência Indígena) with the help and support of other organizations and agencies. The event welcomed more than 400 Indigenous Peoples from all over the world. Its precursor was the Kari-Oca I conference, which took place in 1992, at the Earth Summit in Rio (UNCED). Kari-Oca II took place June 13-22 in Rio de Janeiro. The 10 days were filled with activities from morning till night: meetings of the Indigenous Peoples where pressing issues were discussed, from the Belo Monte dam, to carbon credits and land grabs. There were daily work sessions to draft the declaration that would be the outcome of the conference, trips to the People’s Summit for Social and Environmental Justice during Rio+20, and the “Green Games”: cultural demonstrations and sports competitions open to the general public, in an effort to familiarize as many people as possible with the richness and beauty of indigenous cultures in across the globe. The venue of Kari-Oca II was the “Kari-Oca village”, located on the Fiorcruz campus in the north-western part of Rio, the same sit of the Kari-Oca I conference. Some of the participants were leaders and organizers of the Kari-Oca I conference, 20 years ago. About 20 members of the Kamayura people arrived from their home in Xingu 2 weeks earlier to build two traditional ocas (longhouses) next to the arena where the Green Games unfolded. An electronic longhouse (Oca Electronica) was equipped with computers and internet connection and kept all participants linked to the rest of the world. On the main front patio, a beautiful Oca da Sabeduria (Wisdom Longhouse) held daily debates on environment, rights of indigenous peoples and Mother Earth, and other ardent issues. The Kari-Oca village was visited by government officials, and other important figures, some of the most notable ones being chief Raoni, and the princess of Kuwait. 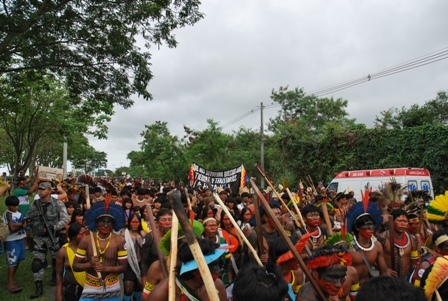 Indigenous People from Brazil that attended Kari-Oca took 3 or 4-day trips by boat, by truck, by bus, to join hundreds of their brothers and sisters from abroad. The Kari-Oca Caravan brought 54 leaders from Bolivia, Peru and Ecuador who travelled 9 days by bus across 5 countries, to join forces with Kari-Oca II participants. 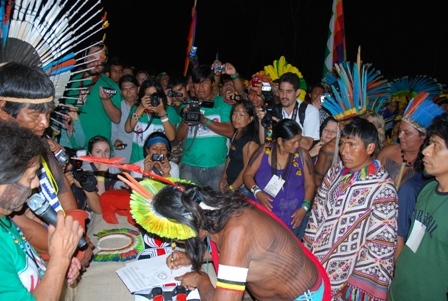 The event was opened by a spiritual ceremony and the lighting up of the sacred fire, and it culminated with the signing of Kari-Oca II Declaration (click here to read), followed by an impressive march of more than 400 indigenous people to Rio+20 site. Marcos Terena, one of the organizers and a prominent indigenous leader, walked into the Rio+20 conference and delivered the declaration to the UN Director for Sustainable Development Nikhil Seth, and Gilberto Carvalho, the Chief Minister to the Presidency of Brazil. The Declaration contains the Indigenous Peoples demands and recommendations for sustainable development and protection of the environment. It criticizes the “green economy” promoted strongly at Rio+20, stating that Indigenous Peoples are against the commodifying of nature, calling it the “capitalism of nature”. It decries the violation of the Indigenous Peoples rights to self determination, land, territories, resources, and to self-determined development. It criticizes unsustainable agricultural projects (chemically treated soya plantations), big infrastructure projects (hydroelectric dams), extractive industries , all which are a threat to the lives and livelihoods of Indigenous Peoples by poisoning and destroying their lands, besides contributing to climate change. The declaration demands respect for and protection of Mother Earth, lamenting the “continued economic colonization and degradation of Mother Earth and all life upon her”. It asks the UN and governments to stop looking for false solutions which will only further destroy Mother Earth, and demands the participation of Indigenous Peoples in decision making processes and the respect of their right to free prior and informed consent. The event showed the important role that Indigenous People play in the big picture of sustainable development, demonstrated their capabilities of organizing themselves and delivering solutions to acute environmental, social and economic problems the world is facing right now.